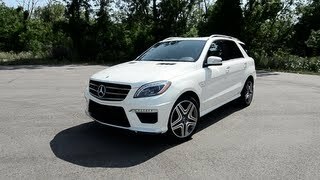 The Mercedes Benz ML63 AMG 2012 will make it global debut at the LA Auto Show 2011. The Mercedes ML63 AMG unites efficiency and performance, exclusivity and an outstanding driving experience using the AMG 5.5-liter V8 biturbo engine with an output of 518 hp and torque of 516 lb-ft, representing an increase of 15 hp and 44 lb-ft over its predecessor. Making its worldwide debut at the 2011 Los Angeles Auto Show, the 2012 Mercedes-Benz ML63 AMG unites efficiency and performance, exclusivity and an outstanding driving experience. The estimated combined fuel economy for the high-performance SUV is 16 mpg, marking a 33-percent improvement over its predecessor. The basis for the excellent fuel economy and performance is the AMG 5.5-liter V8 biturbo engine with an output of 518 hp and torque of 516 lb-ft, representing an increase of 15 hp and 44 lb-ft over its predecessor. The available AMG Performance Package boosts the V8 engine's power output to 550 hp and its maximum torque to 560 lb-ft. The newly developed ACTIVE CURVE SYSTEM for active roll stabilization, the AMG design and the broad scope of standard equipment and appointments produce a highly attractive overall package. The 2012MY ML63 AMG will be available in US showrooms in Q1 2012. Ola Källenius, Chairman of Mercedes-AMG GmbH, notes: "Like its predecessors, the 2012 ML63 AMG sets new standards in terms of performance, exclusivity and an outstanding driving experience – plus the efficiency factor, which is acquiring ever greater emphasis at Mercedes-AMG. As the inventor of the high-performance SUV, we remain true to the philosophy which we introduced in 1999 with the 2000MY ML55 AMG and continued with the 2007MY ML63 AMG." The new ML63 AMG showcases exceptional new technology. The AMG 5.5-liter V8 biturbo engine features spray-guided gasoline direct injection with piezo injectors, ECO stop/start system, an all-aluminum crankcase, four valves per cylinder with camshaft adjustment, air-to-water charge air cooling and efficient alternator management. With a displacement of 5461 cc, the eight-cylinder engine generates a maximum power output of 518 hp and 516 lb-ft of torque. Combined with the AMG Performance Package, these values rise to 550 hp and 560 lb-ft. This difference in power and torque results from an increase in the maximum charge pressure from 14.0 to 18.8 psi. Both variants of the ML63 AMG deliver sports-car performance. Acceleration from zero to 60 mph takes 4.7 seconds and 4.6 seconds respectively, while the top speed remains at 155 mph (electronically limited) and at 174 mph with the AMG Performance Package. With or without the AMG Performance Package, fuel economy remains unchanged. The AMG Performance Package also includes an engine cover in high-quality genuine carbon fiber, calipers painted in red and the AMG Performance steering wheel in Premium leather/DINAMICA. Power delivery to all four permanently driven wheels is via the AMG SPEEDSHIFT PLUS 7-speed automatic transmission. Featuring three driving programs and a rev-matching function for downshifting, this outstanding gearbox offers amazingly broad scope. In "Controlled Efficiency" mode (C) the ECO stop/start function is active, shutting down the eight-cylinder engine when the vehicle is stationary. The "C" mode also delivers smoother acceleration and transmission characteristics with comfortable, earlier gear changes. Pulling away in this mode usually begins in second gear. A green "ECO" symbol in the AMG instrument cluster indicates that the ECO stop/start function is active. In the Sport (S) and Manual (M) driving programs the ECO stop/start function is inactive and the engine/transmission characteristics are far more agile. A brief and precisely defined retardation of ignition and injection during upshift at full load also delivers shorter shift times. For added efficiency, the AMG SPEEDSHIFT PLUS 7-speed automatic transmission incorporates a new fuel-efficient torque converter, bearings designed for reduced friction loss and a thermal management system for the transmission oil. Axle gears with minimal friction loss, electronic steering, an optimized belt drive, on-demand control of all accessory drives and an intelligent lightweight design also help to reduce fuel consumption even further. The new ML63 AMG is 99 pounds lighter than its predecessor – despite the increase in power and the more comprehensive range of standard equipment. As on the previous model, Mercedes-AMG uses a dedicated transfer case for the 4MATIC permanent all-wheel drive, which distributes engine power at a ratio of 40:60 to the front and rear axle for improved dynamic characteristics. Furthermore, the AMG sports suspension with AIRMATIC Air Suspension, independent damper struts, automatic level control and Adaptive Damping System (ADS) is combined for the first time with the ACTIVE CURVE SYSTEM for active roll stabilization. This system, which is standard equipment on the ML63 AMG, features active stabilizers on the front and rear axles to compensate for body roll during cornering. In addition to enhanced agility and driving fun, the system also improves stability for added safety, especially at higher speeds. Roll stabilization, damping and suspension adapt instantaneously to the prevailing driving situation, offering optimum ride comfort and maximum stability. The driver can choose at the touch of a button between the three driving modes "Comfort", "Sport" and "Manual". The air suspension system is speed-sensitive, lowering the body at higher speeds to minimize drag while increasing stability. The AMG elastokinematics on the front axle and more robust stabilizer bar on the rear axle improve steering precision. The enhanced drivetrain provides optimum power transmission and hallmark Mercedes reliability. The standard 4ETS electronic traction control system provides the best possible grip in slippery conditions. Electromechanical AMG speed-sensitive sports steering features speed-based power assistance and helps to save fuel because it only consumes energy when the driver actually moves the steering wheel. The ML63 AMG comes with 20­inch 5-spoke alloy wheels painted in titanium grey with a high-gloss finish and fitted with 265/45 R 20 high-performance tires. Also available are optional 295/35 R 21 tires on 21-inch AMG alloy wheels. The AMG high-performance braking system provides the shortest possible braking distances and high fade resistance, featuring ventilated and perforated brake discs at all four corners. Sizes are 15.4" x 1.4" (front) and 13.6" x 1.0" (rear). The design of the new ML63 AMG exudes self-confidence, athleticism and power. AMG styling dominates the front view. Beneath the radiator grille with louvers in high-gloss paint finish and the prominent Mercedes star is a large cooling air intake. Together with the two air intakes, the central radiator grille provides effective airflow to the radiator, as well as the engine oil, charge air and transmission oil coolers. Fitted at the bottom of the AMG front skirt is a trim strip in matte silver chrome, which lends breadth to the front end while blending with the frames of the daytime running lights and into the side air intakes. Bixenon headlamps offer a premium and and exclusive look in combination with the standard Lighting Package. The AMG front skirt is integrated into the distinctive front fenders, which are 0.4 inches wider on either side to accommodate the large AMG alloy wheels. Prominent, fender-mounted "V8 BITURBO" badges identify the vehicle as the top AMG model in the M-Class. AMG illuminated sill panels feature dynamic styling and establish a visual link between the front and rear of the vehicle. Another eye-catching feature is the AMG rear skirt highlighting the black diffuser. The openings emphasize the vehicle's width, as does the trim strip in matte silver chrome - which reflects the design of the front skirt and frames the AMG sports exhaust system. In contrast to the other M-Class variants, the ML63 AMG features two sets of chrome twin tailpipes, providing that distinctive AMG eight-cylinder sound. Sporty character and premium quality define the interior of the high-performance SUV from AMG. This is evident in the standarddesignopremium leather AMG power sports seats offering excellent lateral support, as well as the four-spoke AMG Performance steering wheel. The latter ensures excellent vehicle control with perforated leather grips, aluminum shift paddles and a rim flattened on the bottom. Aluminum trim elements and the piano-lacquer retractable cover in the center console highlight the interior's dynamic and exclusive flair. The standarddesignopremium leather upholstery includes contrasting double topstitching and AMG badges in the backrests of the front seats and the outer rear seats. Dashboard, armrests and door trim are also finished indesignopremium leather with double topstitching. The distinctive instrument cluster with color TFT monitor, AMG welcome logo and AMG main menu is exclusive to the ML63 AMG. The standarddesignofeatures on the ML63 AMG include premium leather upholstery on the AMG sports seats. This is available in a choice ofdesignoauburn brown,designoporcelain anddesignoblack. Features also include AMG badges in the backrests of the front seats and the outer rear seats as well as velour floor mats with the AMG logo embossed and blackdesignoleather edging. Further choices includedesignotrim pieces in black piano lacquer and thedesignowood/leather steering wheel in black piano lacquer. In line with the Mercedes-Benz brand philosophy, the 2012 ML63 AMG is based on the Mercedes-Benz concept of Real Life Safety, derived primarily from what happens in a real accident situation. The extremely robust occupant cell and the front and rear crumple zones form an effective basis for the occupant protection system. Nine airbags, activated on demand in accordance with the nature and severity of the accident, can reduce the loads exerted on the occupants. In addition to active safety systems such as the standard Brake Assist (BAS) or the optional BAS PLUS, which can help to prevent an accident or reduce its severity, the new M-Class features further enhanced passive-safety measures to help protect pedestrians. Both active safety and driver fitness are improved by assistance systems already familiar primarily from the S- and E-Class. Standard equipment includes the drowsiness detection system ATTENTION ASSIST, the anticipatory safety system PRE-SAFE¨, Blind Spot Assist and Lane Keeping Assist, as well as ADAPTIVE BRAKE, the ESP¨electronic stability program and PARKTRONIC with Active Parking Assist. Further active assistance systems such as Active Lane Keeping Assist and Active Blind Spot Assist are available as additional equipment. 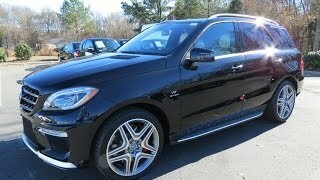 The new ML63 AMG from Mercedes-AMG represents the third generation of the high-performance sport utility vehicle. The company from Affalterbach was the first to identify the potential of powerful and exclusive off-road vehicles and is recognized as the founder of the high-performance SUV segment. It all began in 1999 with the 2000MY ML55 AMG. With a power output of342 hp, the top-of-the-range M-Class model powered by an AMG 5.5-liter V8 engine achieved a level of performance previously unheard-of in this class, with acceleration from 0 to 60 mph in just 6.7 seconds. The unusual combination of high-caliber drive, excellent off-road capabilities, outstanding ride comfort, unparalleled safety and a spacious interior was well-received by AMG customers across the globe. More than 11,000 ML55 AMGs were sold worldwide between 1999 and 2003. The follow-up ML63 AMG, which was presented at the Frankfurt International Motor Show in September 2005, continued the success story that began with the ML55 AMG. With its AMG 6.3-liter V8 engine generating an output of503 hpand 465 lbs-ft of torque, it again set the benchmark in its segment. The performance of the 2007MY ML63 AMG was in the sports-car league. The top-of-the-range AMG model accelerated from 0 to 60 mph in 4.8 seconds and had a top speed of 155 mph (electronically limited). More than 13,000 units were sold worldwide between 2006 and 2011. In all, AMG's sales figures for its high-performance SUVs total more than 24,000 to date. The 2012MY Mercedes-Benz ML63 AMG will be launched in Q1 2012.